Contemporary Philosophy in the United States: John R. Searle. Contemporary Philosophy: A Second Look: Bernard Williams. Part I: Areas of Philosophy:. 1. Epistemology: A. C. Grayling. 2. Metaphysics: Simon Blackburn, with a section on Time Robin Le Poidevin. 3. Philosophy of Language: Martin Davies. 4. Philosophy of Logic: A. W. Moore. 5. Philosophy of Mind: William G. Lycan. 8. Political and Social Philosophy: David Archard. 9. Philosophy of Science: David Papineau. 10. Philosophy of Biology: Elliott Sober. 11. Philosophy of Mathematics: Mary Tiles. 12. Philosophy of Social Science: Martin Hollis. 13. Philosophy of Law: N. E. Simmonds. 14. Philosophy of History: Leon Pompa. 15: Philosophy of Religion: Charles Taliaferro. 16. Applied Ethics: John Haldane. 17. Bioethics, Medical Ethics and Genethics: Rebecca Bennett, Charles A. Erin, John Harris & Søren Holm. 18. Environmental Ethics: Holmes Rolston, III. 19. Business Ethics: Georges Enderle. 20: Philosophy and Feminism: Jean Grimshaw & Miranda Fricker. 21. Ethnicity, Culture and Philosophy: Robert Bernasconi. Part II History of Philosophy:. 22. Ancient Greek Philosophy: Robert Wardy. 23. Plato and Aristotle: Lesley Brown. 24. Medieval Philosophy: Jorge Gracia. 25. Francis Bacon: Stephen Gaukroger. 26. Descartes and Malebranche: Richard Francks & George MacDonald Ross. 27. Spinoza and Leibniz: Richard Francks & George MacDonald Ross. 29. Locke: R. S. Woolhouse. 35. Bentham, Mill and Sidgwick: Ross Harrison. 37. Frege and Russell: R. M. Sainsbury. 40. Nietzsche: David E. Cooper. 41. Husserl and Heidegger: Taylor Carmen. 42. Sartre, Foucault and Derrida: Gary Gutting. Second edition of a distinguished and flexible introductory textbook. 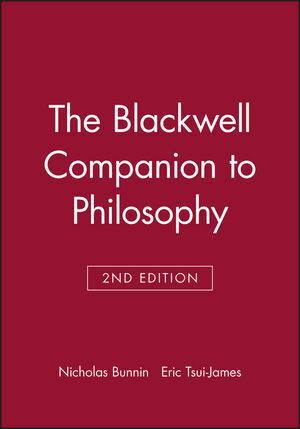 Provides comprehensive and authoritative explorations of key issues, controversies and problems in the study of philosophy. Incorporates a number of new chapters on the hottest topics and figures in philosophy, including genethics; environmental ethics; ethnicity, culture and philosophy; Plato and Aristotle; Francis Bacon; and Sartre, Foucault and Derrida. Includes revisions to several existing chapters. Offers extensive aids to pedagogy, including cross references, glossary entries, boxed highlights, bibliographies, discussion questions, and suggestions for further reading.